Check this out! It’s a Chinese styled animated interpretation of Batman (especially the recent film the Dark Knight Rises). There’s no spoilers in here, so it’s safe to watch. It features Catwoman, Batman and Bane. Unfortunately, there’s no Chinese speaking in it, but there are some Chinese characters. Check the video first. It’s awesome! Edit: Commenters have corrected my guesses at the Chinese on the signs. To make this post a little bit cleaner, I’m going to post what I first thought, then the corrections. Cool hey!? 1930’s Shanghai, Batman, cool animation. What’s not to like? 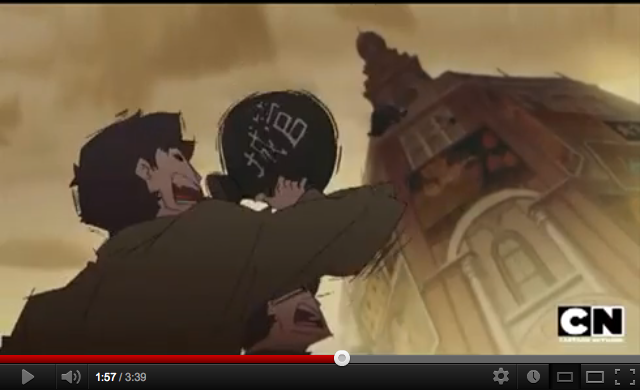 Anyhoo, check out some of the Chinese characters I snapped from the video. I’m not really sure if they mean anything. I’ll need your help. Bane is on a rampage and crashes through some shops. 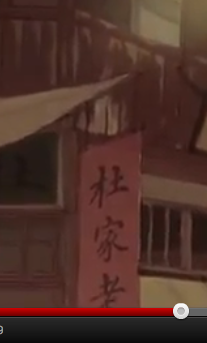 The hanging sign says 躴油, lang oil? Any advanced learners care to help? 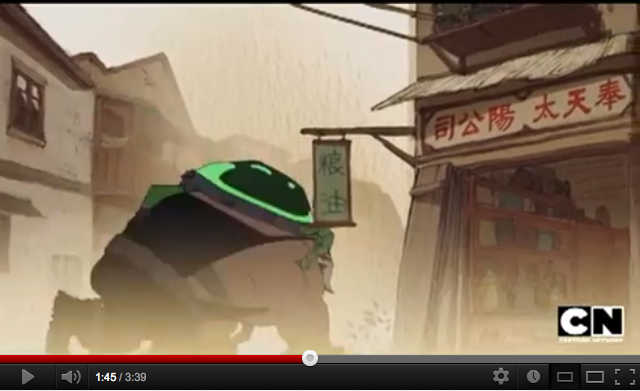 Then there is the shop sign 公司陽 太天奉. Probably means “Yang Company” and then “Most revered/respected”? 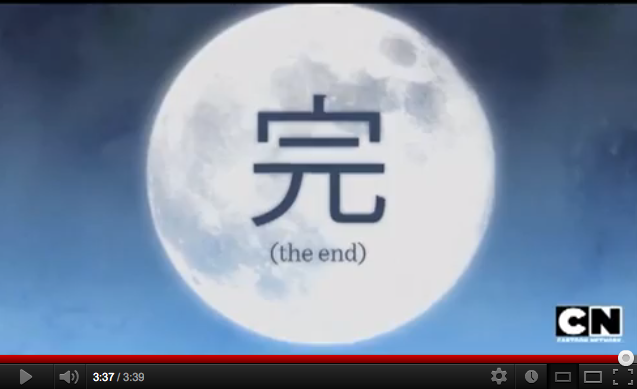 Heck, I’m assuming the Chinese they used in this video is real, otherwise I’m going on a wild goose chase. Edit 1 (By me): Summer pointed out in the comments that Chinese used to be read right to left in reference to the 皮影戏 picture below, which I completely forgot about. Fail me. I went back and checked this horizontal sign again. I got it wrong too! If you switch it around (read right to left) you get 奉天太陽公司 which refers to an old tobacco company. Edit 2 (Sheenky’s words): In the first scene, the characters are 粮油, which means rice and oil, not 躴油. Then the “公司陽 太天奉” actually should be the other way around, that is 奉天, which in english is Fengtian Sun Company. Because in ancient China, people used to read and write character from right to left. 奉天 is a name of a place in China. I have googled the 奉天太陽公司 which there’s no results matched. But there is an old company named 奉天太陽煙公司 which is what you’ve mentioned as an old tobacco company. But in the movie scene, I don’t think that’s exactly the tobacco. I think 奉天太陽公司 is just a general company which sells rice and oil. The sign to the left says 杜家者 (dù jiā zhě). Another blank here. The 者 suffix usually is a suffix a type of person doing something. Like an author is 作者. Edit 1 (Sheenky’s words): About the 杜家者, actually it should be 杜家老铺 which you can get it only if you watch the scene very carefully. 杜家老铺 which means an old shop with an owner surnamed Du, in English it’s just like Du’s. Now this one I know! 城管 (chéngguǎn). If you read a bit of Chinese news, you’ll notice 城管 come up quite a lot. Their like a local law enforcement group and often cause trouble. They’re not very well liked. Now this scene I thought was particularly clever. 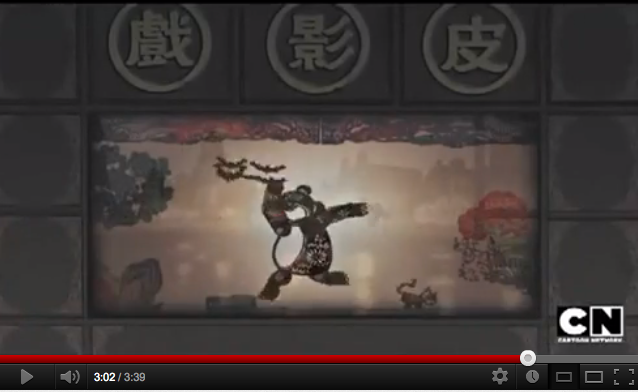 They use the Chinese shadow puppets to portray the battle. But wait a minute... 皮影戏 (píyǐngxì) is what it is usually called. Why did swap the first & last character? Strange. Maybe that's why the first signs are unfamiliar? Edit 1 (By me): Summer posted a comment below that Chinese used to be read from right to left. I completely forgot that! Woops. Thanks for the correction. Although the Chinese in this video is a bit lacking, it's still awesome to watch! Hopefully some people can help me with the first signs?